Welcome to the new Stripy Horse Blog! Over the next few posts we’ll be telling you a bit about what we’ve been up to. The last couple of months have been very busy with the publication of our messy new picture book OH NO, MONSTER TOMATO! – a proper pantomime story, complete with giant vegetables, songs and plenty of ketchuppy splatting! 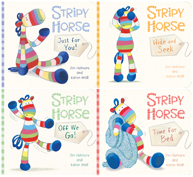 Can’t wait to see the new book I love the Stripey Horse series. 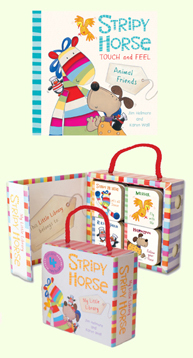 The stripey horse toy is also my favourite. 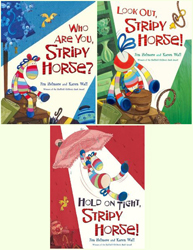 my 3 yr old son loves the stripey horse collection and has just received the new hold on tight book. he has the whole set and the toy to go with them that he takes to bed every night. will there be any more books to add to this collection? So happy that your little boy is a Stripy Horse fan and hope that he enjoyed the new story as much as the others. Jim is working on an idea for a fourth story at the moment but it may be a while before this turns into a finished book. 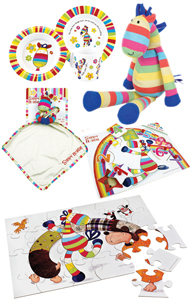 In the meantime we’ve been working on some Stripy Horse things for younger children, so the next additions to the stable are a melamine breakfast set and two Stripy Horse board books which should be be available towards the end of this year.